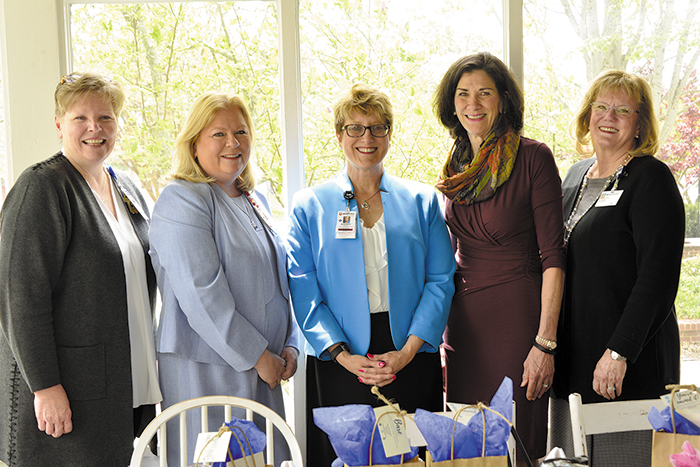 Wanda Rook-Peperone, Saint Francis Bartlett; Kathleen Seerup, Le Bonheur; Kathy Barnes, Methodist Germantown; Lisa Cox Schafer, Regional One; Susan Ferguson, Baptist Memorial Health Care Corporation. 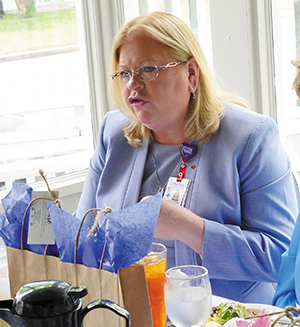 Editor's note: Five chief nursing officers from five Memphis hospitals were invited by the Memphis Medical News to participate in a roundtable discussion during a luncheon at the new G Alston Restaurant in Cordova. The publication has gleaned the group's critical and compassionate assessment of key nursing issues and transposed the remarks into this feature-length article in honor of the profession many call "the heart of health care." The month of May celebrates nursing and includes National Nurses Week. As the top nursing management professional in any healthcare organization, the chief nursing officer (CNO) must wear many hats and work with other healthcare leaders to establish policies that benefit the entire nursing staff and improve clinical care. Now more than ever, CNOs play a vital role and offer unique clinical insights in day-to-day staff operations. They spearhead hospital management issues such as quality of care, patient safety, patient and family experience, nursing standards of care, leadership development, succession planning, personnel management and budgetary responsibility. Recently, in honor of National Nurses Week, May 6-12, a group of five CNOs took a critical and compassionate look at key issues facing chief nursing officers in the Mid-South today at a roundtable discussion conducted by Pamela Harris, publisher of the Memphis Medical News. They discussed the nationally high turnover rate of CNOs, the challenge of retaining a reliable staff, current nurse recognition practices and how their personal experiences have assisted them professionally over the years. Title, hospital - Chief nursing officer, Methodist Le Bonheur Germantown Hospital. Nursing School - BSN and Masters of Science in Nursing from St. Louis University. Nursing experience -SSM Health St. Mary's Hospital, St. Louis, where she served as administrative director of nursing operations. Other leadership positions include the interim chief nursing officer and director, critical care services. Credentials - Adjunct professor in the Webster University graduate program. Board certified nurse executive by the American Nurses Credentialing Center and a Magnet appraiser for the American Nurses Credentialing Center Magnet Recognition Program. All five CNOs agreed that turnover among CNOs is high nationally. Three of the five CNOs present at the roundtable discussion have been in their roles for less than one year and the other two for less than five years. This reflects a national trend. According to the American College of Healthcare Executives, CNOs tend to stay in their roles for two and a half to five years. Saint Francis' Rook-Peperone agreed this national trend is reflected in the Mid-South. "The average CNO stays in the position from three to eight years in the Memphis area," she said. "It's a tremendous responsibility as it takes time to get settled into the role and build a team which builds longevity." All five experts said CNO turnover is related to many changing factors, including hospital CEO turnover, the retirement of longtime CNOs, job availability and location. Regional One's Schafer said the hospital CNO and CEO work together to build a long-term strategic plan for the healthcare system. As a result, she said the greatest turnover happens in hospital executive management when the CEO leaves an organization. "The CNO and CEO have a synchronized partnership," she said. "A new CEO wants to choose the CNO on his or her team." Although statistics could not be found for the rate of national CNO turnover, hospital CEO turnover remains at 18 percent for the third consecutive year, according to a report by the American College of Healthcare Executives. Continuous consolidation of healthcare organizations over the past decade and retiring leaders from the baby boomer era influence these turnover rates. Seerup, of Le Bonheur Children's Hospital, agreed that many longtime CNOs at hospitals are retiring, especially in pediatric hospitals. "There wasn't CNO turnover in pediatrics nationally until recently," she said. "Within the last 18 months there have been a large number of CNOs retiring. Generally, CNOs at pediatric hospitals were in the position for a long time. The CNO worked for the same hospital and grew within the organization. "Now, you must step outside the organization to advance. You must move to a larger-scope children's hospital because the same CNO or CEO have been in the same position for a long time." Barnes, the CNO with Methodist Le Bonheur Germantown, said job availability is a factor for many potential CNO candidates. There aren't enough leadership positions available at every hospital. "There are fewer opportunities for advancement the higher up in leadership you go, so you must be prepared to move to a new health system," she said. "There is only one CNO and CEO position for each hospital." Ferguson, the vice president and system chief nurse executive with Baptist, said location plays a role in CNO turnover. She has seen CNO turnover lower in rural areas in the Mid-South. 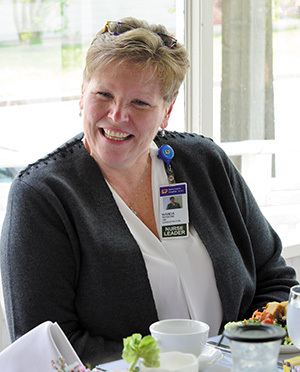 "In a rural community," she said, "the CNO has usually been a nurse for a long time at that facility. There is more competition in a big city. Succession planning is so important and must be in place for when the CNO leaves." All CNOs agreed that it's important for hospitals to consider nurses for executive management positions as they have a unique patient and staff perspective. Ferguson said nurses hold four executive management positions at Baptist. Additionally, Barnes said it's important when researching for a CNO position to look at an organization as a partner. "Look at the culture, values and practice style to make sure there is an affinity there," she said. "It's not a case of just finding a job, but a partner." Title, hospital - Chief Nursing Officer, Saint Francis Hospital-Bartlett. Nursing School - Methodist School of Nursing (Saint Francis University, Joliet, Ill. (BSN); University of Memphis Loewenberg School of Nursing (MSN). Nursing Experience - Critical Care Nursing and Emergency Department Nursing as staff RN with progressive leadership roles in each area (Charge RN, Assistant Nurse Manager, Nurse Manager (Critical Care and Emergency Department), Director Emergency Department, Associate Chief Nursing Officer. All five CNOs said it's a challenge to retain nurses with the many employment options nurses have today, but the answer to retaining good employees is to compassionately listen to them and let them know they make a difference within the organization. "In my experience, the main objective is for nurses to know they have a voice within the organization," Baptist's Ferguson said. "It's important that those in nursing leadership are visible and listen to the staff. Nurses want to be heard and know that they are part of making decisions." Acknowledging nurses in small ways shows nurses they are valued. "Small things mean a lot to a nurse," Le Bonheur's Seerup said. "Sending a birthday card or anniversary card to their home is a small gesture that can go a long way in letting someone know he or she matters." 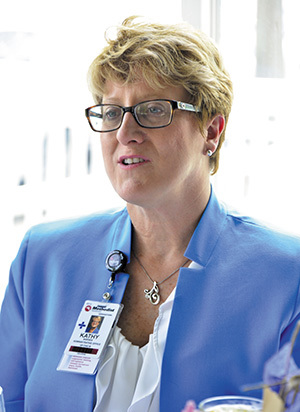 Barnes, of Methodist Le Bonheur Germantown, said the CNO must always be visible and interact with employees. "You have to be accessible," she said. "It's important to leave your desk and walk the hallways. Nurses are vital to an organization. They provide exceptional care at the most vulnerable of times. Be available to them during troubling times. Look at pictures of their children and encourage them to have fun and advance in their career." 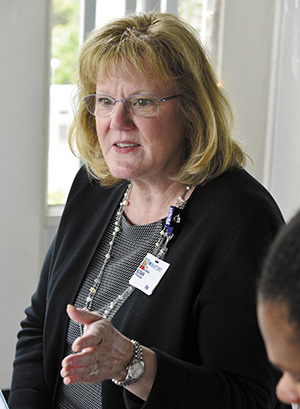 Schafer, at Regional One, said CNOs must recognize nurses more within organizations. Both formal and informal recognition programs can go a long way in retaining nurses. "Engaging your staff and recognizing them for their hard work is key," she said. "Our profession is trained to look at problems and make decisions. People want to know they are valued, and it's our job to focus on them and recognize them." Title, hospital -- Vice President/System Chief Nurse Executive, Baptist Memorial Health Care Corporation. Nursing School - Memphis State University (now University of Memphis Loewenberg College of Nursing). Nursing experience - A 30-year Baptist employee, she has served in a variety of roles throughout the system, most recently as system nursing director for clinical value analysis/specialty care/patient safety. Prior to serving as the system nursing director, Ferguson was BMH-Collierville's CNO; system director of nursing; director of nursing administration; director of oncology services; and CNO for Baptist in the metro-Memphis area, West Tennessee and East Arkansas. She began her career in Baptist's emergency department. Credentials - Received the Tennessee Organization of Nurse Executives (TONE) award for Excellence in Nursing Leadership in 2009, erved on the TONE Board from 2008-2015, was president from 2011-2013. Served on Dean's Advisory Board for Loewenberg College of Nursing. She is a registered nurse and has a master of science. All five CNOs agreed that offering nurses financial incentives to stay with their current healthcare systems assists in retention, but recognition programs give nurses a sense of belonging to a family. Ferguson said small incentives such as offering continuing education and certifications and honoring nurses with the DAISY Award for Extraordinary Nurses, which is a national merit-based award recognition program, showcase that an organization invests in its nurses. Rook-Peperone said that it's important to research how nurses want to be recognized. "For example," she said, "bedside nurses don't like a lot of pomp and circumstance." Schafer said the element of surprise is a fun way to recognize a nurse for his or her work. She recalled a time at another healthcare organization when the CNO dressed in a trench coat and glasses and played the theme to Mission Impossible as part of a nursing recognition program. The CNO gave pens to the nurses that said "Mission Accomplished." Several CNOs said they receive recognition themselves when their staff achieves a milestone. "I'm more metric driven," Schafer said. "My biggest thrill is when my team achieves a goal we've been working toward. It means more to me when something is accomplished by the people I lead." 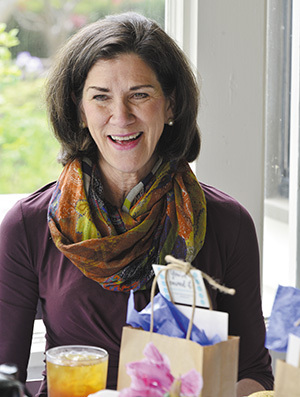 Saint Francis' Rook-Peperone said that when former patients recognize nurses for a job well done, it makes more of an impression, as there is a personal connection between the patient and the nurse. "It's nice to see the staff react to reading letters from their family or to hear from patients who received an exceptional level of care," she said. "When you've touched your team in that way, you feel like you've arrived." Barnes said a visit from a former patient makes a personal and passionate impact. "It's seeing a patient walk who couldn't before that makes such a difference in a nurse's career," she said. "As a nurse, we only touch them at one point during their sickness or recovery." For all CNOs, it's meaningful for them when a former co-worker contacts them about how they made a difference in his or her career. "I received an email one time from a nurse who I helped get employment," Seerup said. "She said, 'Thank you for helping me be the best nurse I can be.' I couldn't get a better compliment than that. It makes a difference when you've had an impact in someone's life like that. You never forget it. I get goose bumps just thinking about it." Title, hospital -- Chief Operating Officer and Chief Nursing Officer, Regional One Health. Nursing School - University of North Carolina, Bachelor of Science in Nursing; and Medical University of South Carolina, Master of Science in Nursing Administration. Nursing experience - Nursing management and leadership roles for more than 30 years in academic medical centers and community hospitals including Scripps Health System in San Diego, California; Roper Saint Francis Healthcare and the Medical University of South Carolina. Credentials - RN, MSN, NEA-BC (Nurse Executive Advanced-Board Certified). All five CNOs had very different personal experiences that made a difference in their career choices, but they all agreed they were attracted to nursing because they wanted to help people and make them better. "I've always wanted to be a nurse," Rook-Peperone said. "When I was little I would use toilet paper to wrap my dolls, which I imagined were hurt and needed care. It's a privilege to be one." For Seerup, choosing to become a nurse was more personal. She wanted to provide the exceptional care that her brother didn't receive when he was terminally ill.
"I wanted to be an accountant at first," she said. "I had two personal experiences which convinced me that nursing was the profession for me. My father had a heart attack at 40 and survived and my brother had metastatic brain cancer. I saw how my brother wasn't provided compassionate care, and I wanted to change that. I wanted to provide compassionate care to people who are sick and become a leader." Ferguson's experience as a nurse was valuable for her current role, but it wasn't until she was in hospital management that she felt she learned the skills necessary to be a hospital executive. "It's through the different leadership positions I've held over the years where I have learned the most, especially those outside my skill set," she said. "I learned how rural hospitals work and how different they function in a small community. For instance, they don't have transportation services or a 24-hour pharmacy. As I look back, one leadership role helped prepare me for the next." Schafer said it's important to have a broad perspective to be a CNO. "Many CNOs come from a background in critical care and emergency care," she said. "It's a fast-paced environment, and you have to make quick decisions. This type of background helps prepare nurses for future leadership roles. You have to focus and stay on course." Title, hospital - Vice President of Patient Care and Chief Nursing Officer, Le Bonheur Children's Hospital. Birthplace - Evergreen Park, Illinois. Nursing Experience -Senior Director, Critical Care Services, Director, Pediatric Intensive Care Unit, Administrative and Operations Manager PICU, Children's Memorial Hospital, Chicago, IL Interim Director PI Registered Nurse, Pediatrics CU, Clinical Manager PIC Team Leader PICU, Family Care Coordinator, PICU, Manager, Clinical Operations, Pediatrics. Credentials -BSN, MSHA, RN, NE-BC.